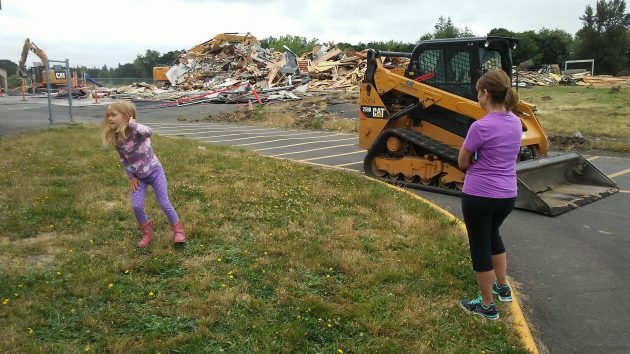 The demolition of Oak Grove School in North Albany drew a small crowd this morning. 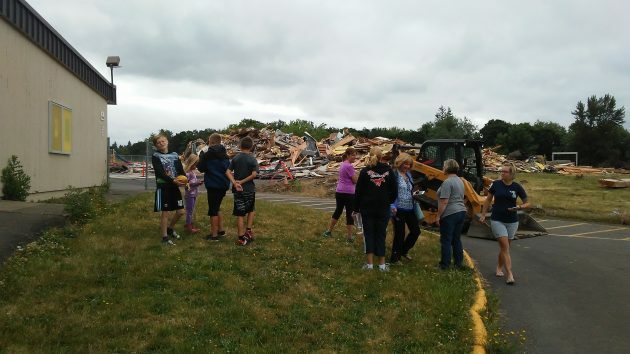 The gym has been reduced to a big pile of rubble, and as these people watched, the operator of a big claw took only minutes to flatten another outbuilding, an open shed. The classroom building presumably would be next. Oak Grove, which enrolled about 290 last school year, is being entirely replaced by a new school with a two-story classroom wing. It will have room for up to 500 pupils. At an estimated cost of $26 million, Oak Grove is part of the Greater Albany School District’s $187 million program to build one new school (Meadow Ridge), replace Oak Grove, and remodel and enlarge South and West high schools, among other projects. At Oak Grove, Gerding Builders of Corvallis is the general contractor. The demolition is being done by D&I Excavating of Silverton.